Die 6 somalische gefangene die wegen des Vorwurfs der Piraterie in Hamburg seit 4 Jahren in Gefängnis sitzen, brauchen weiter unsere Unterstützung . Wenn sie aus dem Gefängnis raus kommen sollten sie nicht ohne Papiere sein. Dafür brauchen sie und wir, ihre Unterstützer_in Gruppe: geld! 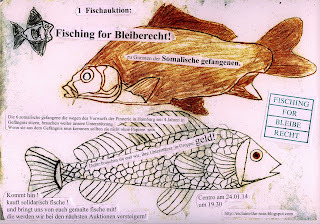 Fische malen. Alle malen fische, bei eure Plenas, mit eure Kinder mit eure Freund_innen, in der Kneipe, zuhause, bei Oma, unterm Weihnachts Baum.Wir brauchen 1.000 FISCHE! dann hätten wir das Geld zusammen um den somalische gefangenen rechtsanwaltliche Beratung für ihre Aufenthalts Titel zu geben. und bringt uns von euch gemalte fische mit! die werden wir bei den nächsten Auktionen versteigern! Ps: In Somalia würden die fische jahrelang weg gefischt von europäischen Trawlern, hier in der Hafenstadt Hamburg zeigen wir seit anfang des Prozesses was Solidarität schaffen kann. Diese 2 fisch Bilder würden von den gefangenen gemalt. Looking at the political background of piracy off the coast of Somalia. Organised by No One Is Illegal Hamburg and Hamburg Harbour Group. All proceeds go to support the Somali ‘pirate’ prisoners in Hamburg. Sunday, 21 July 2013, 5pm at 'Vorsetzen' wharf (access from Landungsbrücken due to construction work). Tickets are €10 waged, €8 unwaged. The cruise takes 90 minutes. The German parliament recently voted to extend the mandate for the EU navy mission Atalanta for another year until May 2014. Up to 1400 soldiers can be deployed under this operation. This includes the mandate for air strikes up to 2km inland, which was introduced last year. Defence Minister Thomas de Maizière pointed out another aspect of Atalanta as the EU’s first combined military involvement, when he linked it to an upcoming EU security conference in December. He also suggested that Atalanta and the NATO mission Ocean Shield should be joined. No one is illegal and the "Pirates"
When the German container ship Taipan was captured by Somali pirates in the Indian Ocean on Easter, 2010, we hardly registered it. After all, piracy is the oldest, or maybe the second oldest profession. We read about it in the papers, just like we had read about the capture of the Hansa Stavanger a year earlier. But when in June 2010 the Dutch navy, which had stormed the Taipan shortly after the attack, brought the ten captured Somali to Hamburg, where they were locked up in the remand prisons, we started asking questions. Firstly, we were startled by the fact that a European navy would simply capture Somali people and take them to Europe – a distance of over 6,000 km. We also thought it was bizarre to try to apply German legal standards when trialling or judging people who were trying to survive in war-torn Somalia. And we wondered why people in small dinghies would try to attack huge container ships. We asked ourselves: who are these men and boys? Where do they come from, what motivates them, what is happening at the Horn of Africa. Where does the phenomenon of piracy in Somalia come from? Why are Somali people locked up behind barbed wire on an island in the Elbe river or in a one hundred year old brick building? What sort of a trial is this, and what is it supposed to achieve? Deterrence? Rehabilitation – into which society? Are "our" trade interests now being defended in the Indian Ocean? And by whom – the military mission Atalanta? The frigate "Rheinland Pfalz"? We soon realised that the reasons are complex and that it would take an entire series of public talks to shed a light on the background; that there is a lot of ignorance and that the political situation is confusing. We invited a range of "experts" on the various subjects: a professor from Berlin who specialises in the geo-strategic aspects of the piracy hunt; a journalist from Bremen who is investigating the illegal arms trade in the region; a piracy researcher; a former maritime law professor, who is now employed by a large insurance company and who brought with him an original tape of a ransom negotiation; the head of the seaman's mission, a Somali political scientist, who now lives in Switzerland; and refugees from Somalia, who talked about their lives in Somalia, their perilous journey to Europe and within Europe as well as their current lives. We became "experts" in illegal waste dumping and the plunder of fish. There is now a special harbour cruise on the subject. We met with the defence lawyers of the piracy trial and we visited the prisoners in prison and outside. A trial observer group was started which minuted every one of the 105 trial dates. Now, more than two and a half years later, the verdicts have been passed. The three under-age accused are "free", after having served two years in remand. The other seven have been sentenced to lengthy jail terms in Hamburg's prisons. And we met and became friends. We "understand" the reasons: forced reasons, desperate, hungry, impoverished, tempting reasons. Or, as Angela Merkel would put it: often without alternatives. Of course we don't believe that kidnapping the crews of fishing vessels, container ships or yachts and keeping them imprisoned for months on end is a good thing. But we also don't subscribe to the idea that more guns will lead to more peace and that the navy ships, military aid or the – now "legal" – bombing of Somali coastal villages will provide a new and better perspective for the people of Somalia. Instead, we are getting more and more the impression that escape is the only unarmed alternative in Somalia. The number of refugees within and from Somalia speak for themselves, and the number of Somali refugees who have lost their lives in the Gulf of Aden or the Mediterranean Sea paint a gruesome picture. Judge Steinmetz said towards the end of the trial: "Even when living in anarchy, one has to distinguish between right and wrong." A German academic with a life-long job in the Hamburg justice system can talk like that. Now you know how No one is illegal came to the "pirates", or rather how the "pirates" came to No one is illegal. Letter to the public - Release of the child of one of the accused. While the written verdict and sentence have only just now – almost three months after the verbal sentence has been passed (*) – been received by the lawyers, the child of one of the prisoners is free! It was released with the money raised from the sale of the booklet about the kidnapping. The verbal sentencing took place in November 2012. With the exception of the 'crown witness', all of the accused filed an appeal. However, the experience of spending two years in remand prison had its effect on the prisoners, and their wish for better conditions in a 'normal' prison was greater, so by and by they withdrew their appeals. Currently, only two of the then juvenile prisoners still have an appeal going. The court remained true to its tradition and took almost three months to release the written sentence, while the verbal sentence had been published on reclaim-the-seas.blogspot.com for weeks – transcribed word for word by trial observers. With the verdict having been received formally by the lawyers, they now have one month to argue their appeal. One could have the impression that the court deliberately waited until the defendants had withdrawn their appeals, public interest in the trial had disappeared and the media had lost interest. But there is one positive development that could still be of public interest: the release of the child of one of the accused. He had told the court how he failed to catch fish any more, was in debt with a grocery store owner and how the shop owner then abducted his 5-year-old son in order to retrieve the money. That is why he had joined the attack on the Taipan - to earn the money to release his son. 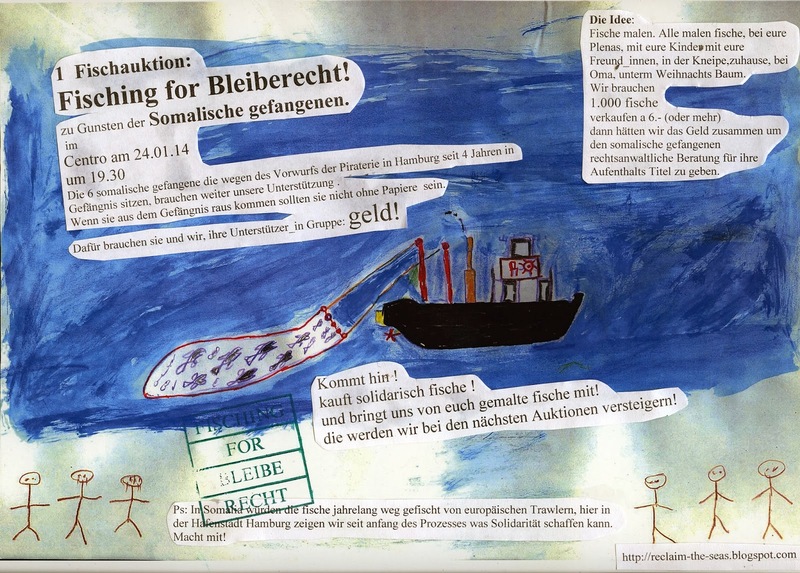 In 2012, the solidarity group produced an illustrated booklet with the story. 380 signed copies of the book were sold for €5 each. The money was used to pay the ransom for the child, while the prisoner was desperately waiting in his prison cell. In December 2012, enough money was collected and in January the money was handed over to the shop owner and subsequently the child was released. The seemingly impossible had been made possible. The release of the child confirms how arrogant the court has been in its attitude towards the defendants. The judge had accused the defendant of lying about his child because he had not repeated the story during his last words in court. Here is some advice for the court: fortunately, there is a life outside the courtroom. In this other life, the defendant knew that money was being collected for the release of his child. That is why he didn't see the need to mention it again. He had given up hope of being understood by the court. Instead, there are people outside the court world who don't want to leave the prisoners to themselves. The group that has been observing the trial is planning further public meetings, harbour cruises, public displays and film screenings, and will continue to sell the booklet in order to support the prisoners and to talk about the situation in Somalia. The Prisoner Support Group, No One Is Illegal Hamburg, Third World Harbour Group Hamburg. (*) In German courts, the verdict and sentence are first passed verbally and then the written version is sent to the lawyers soon afterwards. For this to take several months is highly unsusual. Richter: Und jetzt der letzte Abschnitt: Grundsätzliches zum Verfahren. Es geht ein außergewöhnliches Verfahren zu Ende. Es hat enorme Kosten verursacht. Es ist die ganze Zeit kritisch begleitet worden. In den Schlussvorträgen haben die Verteidiger gesagt, „Das Verfahren ist grandios gescheitert“. Das Gegenteil ist der Fall! Es hat vielfältige Versuche gegeben, dieses Verfahren zum Scheitern zu bringen. Dieses Verfahren war nicht sinnlos. Es war absolut notwendig. Es geht um die Seeleute aller Nationen und deren Schutz. Es geht um die Freiheit des Seeverkehrs. Allein 2010 sind 220 Schiffe angegriffen worden, davon wurden 60 gekapert. Es geht um die Seeleute. Es geht um die betroffene Reederei. Die Seeleute kommen häufig selber aus ärmeren Ländern. Deshalb ist es genau für diese Seeleute wichtig, dass es Verfahren und ein Gericht gibt, das sich mit der Legitimation beschäftigt. Ein häufiger Vorwurf war auch: Das Verfahren habe einen politischen Hintergrund. Es diene der Legitimation des Atalanta-Einsatzes, es solle ein Exempel statuiert werden, das Gericht vertrete die Hamburger Reeder. Es war von Kolonial-, ja, sogar von Feindstrafrecht die Rede. Man unterstellt uns „nachkoloniales Herrschaftsgehabe“. Richter: Wenn Sie sich ruhig verhalten, dürfen Sie bleiben! Die Kammer hat in völliger Unabhängigkeit entschieden. Es sind angemessene Strafen. Natürlich kann dieses Verfahren nicht den Zweck haben, die Probleme der Piraterie vor der Küste Somalias zu lösen. Ja, das Verfahren hat viel zu lange gedauert. 105 Verhandlungstage waren für viele eine enorme Belastung. Zunächst sollte es bis März 2011 gehen. Das Urteil des Oberlandesgerichts vom 27.August 2011 hat dies auch noch mal klar gemacht. Aber die Verzögerung rührte nicht von der Justiz-Seite, vielmehr ist sie dem Verteidigerverhalten geschuldet. Ich muss mal sagen: Sie haben ein typisches Verteidigerverhalten an den Tag gelegt. Man wartet ab, bis das Gericht alles abgearbeitet hat, dann kommen die Einlassungen, dann die Beweisanträge. Die Frage muss erlaubt sein, wieso Einlassungen, wenn der Angeklagte sagt, er ist unschuldig, nicht gleich zu Beginn gemacht werden? So sind Ihre Beweisanträge erstmals am 42., 46., 56 Verhandlungstag aufgetaucht. Das ist zulässig. Ich frage mich jedoch, ob nicht hier Änderungen möglich wären? Warum sagt ein Angeklagter nicht gleich, dass er unschuldig ist? Dieses Gericht ist noch über eine ganze Reihe anderer Dinge erstaunt: Den sachverständigen Ärzten im Universitätskrankenhaus wurde der Vorwurf rechtswidriger Körperverletzung gemacht, weil Angeklagte geröntgt wurden. Kapitän Lodder von der Tromp sollte mit Ordnungsgeld und –haft dazu gebracht werden auszusagen, weil er nicht die Freiheit hatte auszusagen. Einem der niederländischen Zeugen wurde vorgeworfen, er habe mit seiner Ausführung den Tatbestand des Tötens erfüllt. Das Gericht wurde mehrfach aufgefordert, Schmiergelder zu zahlen um Zeugen aus Somalia laden zu können. Was wäre hier im Saal los gewesen, wenn die Staatsanwaltschaft das gesagt hätte?! Dann wurde das Gericht aufgefordert selber nach Somalia zu fahren. Es sollte sich der Regierung und Leibwächtern unterstellen. Wir wissen, dass der Journalist M. von seinen eigenen Leibwächtern entführt wurde. Dann verstehe ich nicht, wie man als Pflichtverteidiger gerade mal an 30 von über 100 Verhandlungstagen es für nötig gehalten hat hier zu erscheinen. Selbstverständlich hat das bei der Beurteilung von Ihnen keine Rolle gespielt. Nun nochmals zum Beschluss: Ja, wir gehen davon aus, dass Sie solange, bis das Urteil rechtskräftig wird, in U-Haft bleiben. Die Haftbefehle von CM,AKD,AD,YK,TW und AA bleiben nach Maßgabe aufrechterhalten. Es besteht weiter Fluchtgefahr. Alle zehn Angeklagten sind darüber zu belehren, dass Rechtsmittel der Revision eingelegt werden können. Dazu haben Sie nur eine Woche nach der mündlichen Urteilsverkündung Zeit. Das kann jeder selber tun, natürlich auch die Verteidiger. Wer nicht lesen und schreiben kann, für den gibt es hier einen Beamten, an den er sich wenden kann und der es für ihn macht. Für die schriftliche Revision haben Sie einen Monat Zeit, nachdem das Urteil schriftlich zugegangen ist. Dazu brauchen Sie einen Anwalt. Gibt es noch von irgendeiner Seite Erklärungen? Man kann das Urteil auch annehmen. Gibt es etwas zu besprechen? Richter: Ja dann: Das war alles, was diese Kammer Ihnen zu sagen hat! Richter: Jetzt zu den Jugendlichen: Das hat uns vor große Probleme gestellt. Bei YM, er ist 17 Jahre alt, kommt das Jugendstrafrecht in Frage. AS und AW, da kommt ebenfalls das Jugendstrafrecht zur Anwendung. Bei ihnen gehen wir von einer Gleichstellung mit einem Jugendlichen aus. Dass Sie unter schwierigen Bedingungen aufgewachsen sind, das macht hart. Es soll aber nicht zu Ihrem Nachteil ausgelegt werden. Die Möglichkeit der Kammer war in diesem Fall dürftig. Einstellung des Verfahrens, das scheitert schlicht schon an der Zustimmung der Staatsanwaltschaft. Sogenannte Zuchtmittel, Verwarnungen oder gemeinnützige Arbeit – das kann man alles nicht machen. Da bleibt nur Jugendstrafrecht. Wir wissen nichts über schädliche Neigungen. Es bleibt die Schwere der Schuld. Die Gefährlichkeit, die Bewaffnung, die Schäden, das Eingebundensein in eine kriminelle Gesamtorganisation – und natürlich die Situation in Somalia. Sie sind mit Sicherheit nicht die Chefs gewesen, das war nahe am Versuch. Und dann die Dauer der Haft, die am 13.April 2012 geendet hat. Alle drei haben die Tat eingeräumt. Und wie sie sich innerhalb und außerhalb der Haft positiv verhalten haben. Herr YM, Sie haben 500 Dollar erwartet, Sie haben sich als Erster und Einziger bei Kapitän Eggers entschuldigt. Wir haben auch erfahren, dass Sie versucht haben sollen, Ihre Familie in Somalia zu unterstützen. Die Schwere der Schuld ist allerdings bejaht. Da gilt ein Strafrahmen von sechs Monaten bis zu zehn Jahren. Also sechs Monate bis zehn Jahre entsprechend dem Gesetz für Verhängung der Jugendstrafe. Aber es war zu prüfen, ob es erzieherisch noch geboten ist. Sie haben sich in der Haft mit der Tat auseinandergesetzt. Spürbare erzieherische Sanktionen sind nicht notwendig gewesen. Wir halten es für nicht erforderlich, dass Sie bei der Entwicklung wieder in Haft gehen. Das ist erzieherisch nicht geboten. Es bestand schon ein Risiko Sie zu entlassen. Es gibt aber keine Beanstandungen. Wir würden Ihnen die Strafe am liebsten zur Bewährung aussetzen, aber Sie waren schon zwei Jahre in Haft. Wir haben auch diskutiert, ob wir drei oder vier Jahre verhängen. Dann könnte der Jugendrichter die Reststrafe zur Bewährung aussetzen. Aber die Kammer wollte die Entscheidung nicht aus der Hand geben. Wir haben auch über die Obergrenze von drei Jahren gesprochen, weil das ausländerrechtliche Konsequenzen hätte. Aber wir haben das verworfen, weil es erzieherisch kontraproduktiv wäre. Uns war wichtig, dass Ihnen das nicht den weiteren Weg verbaut. Deshalb zwei Jahre, aber davon ist nichts mehr zu verbüßen. Der Nachteil ist, dass wir nicht differenzieren konnten. Das hätten wir durchaus gern gewollt! Doch mir ist wichtig, dass Sie nach unserem Urteil nicht wieder in Haft müssen. Richter: Es ist nichts über Vorstrafen bekannt, keine Beanstandungen in der Haft. Aber es ist nicht strafmildernd, dass die Mannschaft der Taipan um die Gefährlichkeit wusste. Die Mannschaft hatte keine andere Wahl. Der polnische Kapitän konnte sich den Luxus leisten, die Taipan zu verlassen. Außerdem fuhr die Taipan außerhalb des Atalanta-Einsatzgebietes. Ergebnis all dessen ist: der Normalstrafrahmen ist auch deswegen richtig, weil es sich um einen Normalfall der Piraterie in Somalia handelt. Aber der Rahmen von fünf bis 15 Jahren ist sehr groß. Da ist doch zu berücksichtigen, dass die Strafe nicht am unteren Rand ist. Die Strafe, die die Staatsanwaltschaft verlangt, hält die Kammer jedoch für eindeutig zu hoch. CM: Sie haben ein frühes Geständnis abgelegt. Ihre persönliche Geschichte. Und Sie leiden bis heute unter Beeinträchtigungen. Deshalb sechs Jahre, drei Monate. AM: Ihre Lebensumstände. Sie haben beide Eltern bei einem Anschlag verloren. Deshalb sieben Jahre. AKD: Sie waren schon früh auf sich selbst gestellt. Deshalb sieben Jahre. KD: Wir gehen davon aus, dass Sie dem Stamm der Al Sharaf angehören, dass Sie beim Überfall auf die Taipan zur Deeskalation beigetragen haben. Sie haben bereits mit den holländischen Behörden zusammengearbeitet. Und der Zeuge de Wind hat ausgesagt, dass die Zusammenarbeit mit Ihnen als wertvoll eingestuft wurde. Bei Ihnen ist eine besondere Haftempfindlichkeit gegeben durch Ihre Isolation in der Gruppe. Sie haben die Tat eingeräumt und dass Sie nicht gezwungen wurden. Zu berücksichtigen ist auch Ihre Krankheit. Nicht strafmildernd ist jedoch insbesondere der Tod des Halbbruders. Wir hegen Zweifel, ob die Geschichte überhaupt stimmt. Sie bekommen die geringste der Strafen: sechs Jahre. YK: Sie haben ein frühes Geständnis abgelegt. Dann die Notlage Ihrer Familie. Sechs Jahre fünf Monate. TW: Für Sie sind es wegen Ihrer besonderen Haftempfindlichkeit sechs Jahre zehn Monate. AA: Bei Ihnen muss Strafmilderung wegen des minderwerten Stammes, dem Sie angehört haben, erwogen werden. Aber Sie haben selbst geschildert, dass Sie sich nicht diskriminiert gefühlt haben. Dass Sie schon mal unter Verdacht standen, werten wir nicht. Für uns ist es so, als wäre es das erste Mal bei Ihnen: Sieben Jahre. Für alle sieben Erwachsenen gilt, die zweieinhalb Jahre werden angerechnet. Auch die Zeit auf der Tromp. Auch die Haftzeit in den Niederlanden wird eins zu eins angerechnet. Richter: Nun zur rechtlichen Bewertung: Sie sind verurteilt wegen des gemeinschaftlichen Angriffs auf den Seeverkehr und vollendeten erpresserischen Menschenraubs. Für den ursprünglichen Tatbestand der Schiffssabotage werden Sie nicht verurteilt, weil dazu der eigentliche Sinn und Zweck des Angriffs die Beschädigung oder Zerstörung gewesen wäre. Natürlich ist was kaputt gegangen, aber das war nicht das Ziel, sondern nur eine Nebenfolge. Der erpresserische Menschenraub ist aus unserer Sicht vollendet und nicht nur versucht. Sie hatten die tatsächliche Verfügungsgewalt über die Besatzung. Auch wenn es ihr gelungen war sich zu verstecken, war sie Ihnen hilflos ausgeliefert. Sie hätten die Möglichkeit gehabt, wenn Sie sie gefunden hätten, sie mit zum Beispiel dem Granatwerfer aus dem Sicherheitsraum herauszuholen. Es wäre dann möglich gewesen, Fahrtrichtung und Geschwindigkeit zu bestimmen. Auch aus Sicht der Mannschaft hat sie sich in Ihrer Gewalt gefühlt. Sie hat Ihre Ermächtigung schon gespürt. Sie wusste, sie war in der Hand von Piraten. Sie konnte Sie sogar hören. Auf Anweisung von Kapitän Eggers mussten sie sich still auf den Boden legen. Das war nicht nur ein Versuch, sondern erpresserischer Menschenraub. During his reading of the verdict and sentences, judge Steinmetz made a particularly humiliating and hurtful remark. He said that he didn't believe AW's explanation that his child had been kidnapped because he was owing money to a shopkeeper and that this had been the reason why he had participated in the attack on the Taipan. The judge said he didn't believe AW because he had not repeated that story in his last words on the last day of the trial. It must have been difficult for AW to remain calm and quiet when he heard that he was given a harsher sentence as a result. But other people did believe him and raised the money required to have the young boy released by producing a fundraiser book "The confiscated child". 380 copies of the book were sold – enough to have the child released. The money was transferred to Somalia and we have just had confirmation that the boy has been released and is safe with his family! All this, while the court is still working on typing up the written verdict, which again shows the court's ignorance and inability to understand the world outside of its own confinement. Richter: Und nun möchte ich etwas sagen zu den Verfahrenshindernissen, die hier immer wieder genannt worden sind: Dieses Gericht, alle Richter, beisitzenden Richter und auch mit den Schöffen hat nie daran gezweifelt, dass auf den Fall hier deutsches Strafrecht Anwendung finden muss. Zwei deutsche Seeleute sind Opfer einer Straftat. Hier gilt das passive Personalitätsprinzip. Die Taipan fuhr unter deutscher Flagge, da gilt das deutsche Strafrecht. Und es geht um den Schutz des internationalen Seeverkehrs vor Piraterie. Da gilt auch für die Beurteilung deutschen Rechts das Weltrechtsprinzip. Die Taipan gehört einer Hamburger Reederei. Auch sonst sind Hamburger Gerichte zuständig, wenn auf Hoher See eine Straftat begangen wird. Ich habe immer wieder gehört, dass doch der Internationale Seegerichtshof dafür zuständig sei. Aber der hat dafür keinerlei Kompetenz. Der ist zuständig für Streitigkeiten über Schiffe oder Streitigkeiten um Rohstoffe auf dem Meeresboden. Er hat nicht die Befugnis erhalten, Straftäter zu verurteilen oder Verdächtige zu befragen. 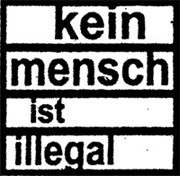 Es gibt ja auch keinen Internationalen Gerichtshof für Drogen, oder einen Internationalen Gerichtshof für Menschenhandel, oder für Kinderpornografie. All adult prisoners have now withdrawn their appeals. This means that - apart from the 'crown witness', who is on day probation in another institution - all of them are now in Fuhlsbüttel Prison, where they can have contact with each other. Richter: Lassen Sie uns, bitte, fortsetzen! Nehmen Sie bitte Platz! So, soweit erst mal zur Zwangsrekrutierung. Das Thema verlass ich jetzt. Ich gehe jetzt ein auf die Einlassungen einzelner Angeklagten. Das sind Verschiedene erwähnenswert, insbesondere weil wir da zu anderen Erkenntnissen gekommen sind. AW: Sie gaben an, zur Tatzeit dreizehn Jahre alt gewesen zu sein. Wenn das richtig wäre, wären Sie ein strafunmündiges Kind gewesen, dann hätte gegen Sie kein Strafverfahren durchgeführt werden dürfen. Wir haben aber keinerlei Zweifel, dass das, was die Herren Sachverständigen H… und Fuhrmann angegeben haben, richtig ist. Sie waren zur Tatzeit über 18 Jahre alt! Aber auch an den drei Schriftstücken hegen wir große Zweifel! Diese angeblichen Urkunden und Schulbescheinigungen, die uns Ihre Mutter zukommen ließ, da haben wir erheblich Zweifel, ob die überhaupt echt sind! Auch andere Angeklagte haben ähnlich aussehende Schriftstücke vorgelegt. Sie waren alle aus Galkayo und es stand „District Court“ drauf. Der Zeuge J… vom Bundesamt für Migration hat glaubhaft gemacht, dass es schwierig ist mit solchen Urkunden. Ebenso verhält es sich auch mit den Altersgutachten. YK, KD und AS – teilweise haben sich die Angeklagten auch damit einverstanden erklärt. In einem Fall war die Altersangabe auch richtig, nämlich bei AS, und stimmte mit dem Altersgutachten überein. Herr AM, Sie geben an, dass der Anlass der Entführung von Ihnen ein überraschend zurückgefordertes Darlehen war. Wir fragen uns, warum man Ihnen erst 500 Dollar für die Errichtung einer Schule im Flüchtlingslager gegeben hat und die dann zurückgefordert hat. Wenn Sie als gut Englisch sprechender aufgrund Ihrer Sprachkenntnisse angesprochen worden wären, das verstehen wir ja noch. Und Sie haben „Shinu“ als Augenzeugen Ihrer Entführung angegeben. Just die Nummer dieses Zeugen befindet sich im Mobiltelefon von CM. Herr AKD: Sie gaben an unter Täuschung auf See gebracht worden zu sein. Dann haben Sie das durch eine neue Einlassung wieder in Frage gestellt, haben versucht, Ihre Einlassung anzupassen. Sie haben ein Aussageverhalten, das sich am Prozessverlauf orientiert. Insgesamt ist das zweifelhaft. Herr TW: Sie gaben an, Sie seien betrunken gewesen und so an Bord der Dhau gekommen. Auf dem Skiff seien Sie dann ohnmächtig geworden. Das alles ist zweifelhaft. Herr AA: Sie gaben an, selber ein Piratenopfer gewesen zu sein, dass man Sie zu dem Überfall gezwungen hätte. Wir halten das für widerlegt. Drei Wochen vorher waren Sie von der niederländischen Fregatte Tromp bereits aufgegriffen worden. Sie standen schon im März 2010 im Verdacht. Im Skiff hatte man Waffen, aber keine Fischereiwerkzeuge gefunden. Von den niederländischen Soldaten wurde Ihnen dann das Turaya-Telefon mitgegeben. Und genau dieses hat man dann an Bord der Taipan wiedergefunden. Man hatte Sie also schon einmal in Verdacht und Sie sind hier wiedererkannt worden. Dass Sie selbst das Opfer gewesen sein sollen, das ist eindeutig widerlegt. Das Gericht ist zu der Überzeugung gekommen, dass hier keiner gezwungen wurde. Die Zeugen, die indischen Seeleute, die sich auf der Dhau befunden haben, sind selber Opfer eines Angriffs gewesen. Es ist uns leider nicht gelungen, sie hier im Gerichtssaal zu befragen, auch nicht in Mumbai. Aber der Zeuge Raman hat uns hier sein Videomaterial von dem Interview mit ihnen gezeigt. Danach gibt es keinerlei Hinweise darauf, dass Einzelne von Ihnen auf der HudHud wie Gefangene behandelt wurden. Der Dolmetscher bittet wegen eines Dolmetscherwechsels um Unterbrechung: Herr Doktor Steinmetz!